TAPA Room 210: 蜘蛛巣城 = MacBeth (?) You're about to find out. 蜘蛛巣城 = MacBeth (?) You're about to find out. I will give you points for doing this (or give you a 0% for not doing it) by NEXT CLASS, so please do this as soon as possible! 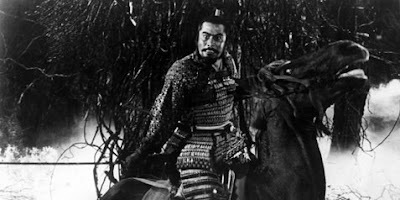 The key difference between William Shakespeare's MacBeth and Akira Kurosawa's Throne of Blood is [WHATEVER YOU THINK], easily seen through [EVIDENCE A], [EVIDENCE B], and [EVIDENCE C]. This sentence must be in your essay for get points for the thesis. You are not required to use that sentence in your essay, but if you use your own thesis, it must be better than mine. And it won't be. Good luck. You MUST bring me your first draft TYPED UP AND PRINTED OUT by NEXT CLASS. Failure to do so will result in an automatic 10% markdown of your final essay score. We will be doing 7i together in class, so not getting it to me means you didn't do it. Make sure it happens. If we have time in class, we'll read the article together; if not, it is your responsibility to do on your own. Same with commenting. No excuses on getting the first draft done, either. The semester is not over! MANY of you have been complaining about your grades being low—this is your chance to pull them up. Unfortunately, it's also the chance for you to ruin them, so work hard! I am so incredibly careless. I forgot to check my comment post on Criterion's blog and posted it with a bunch of mistakes!!! I'm so careless!!!! It's so embarrassing!!! WHY didn't I check BEFORE I clicked the post button?